GoDaddy VP of Public Policy testifies to Congress and answers questions from Ted Cruz. 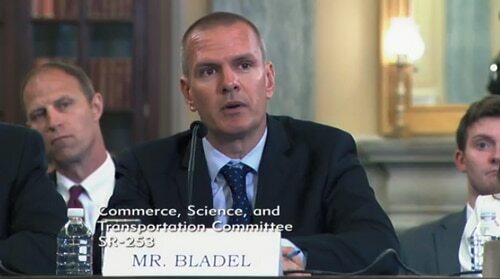 GoDaddy Vice President of Global Policy James Bladel was in Washington, D.C. this morning for a Senate hearing “The Internet and Digital Communications: Examining the Impact of Global Internet Governance”. In his prepared testimony (pdf), Bladel touched on three topics: foreign regulations, GDPR and the Cooperative Agreement between the U.S. government and Verisign when it comes to .com. On the latter, Bladel urged the government to maintain price caps in the Cooperative Agreement. He also urged them to eventually put the .com contract out to competitive bid. Bladel was questioned by Ted Cruz about the first amendment and what role companies like GoDaddy should have in being the arbiters of free speech. It seemed like he might be alluding to GoDaddy kicking out domains like DailyStormer.com. Bladel responded that GoDaddy does not want the role of determining what is free speech, but does enforce its Terms of Service against illegal activity and speech that rises to a level of promoting violence. In 2005, there were only 50 million .com domains in existence. Today, with more than 134 million .COM domain names — the amount of money VeriSign prints is outrageous. Furthermore, the cost to operate the .COM registry has declined because of economies of scale and advances in computing power, including lower costs of both hardware and software. Bottom line — this contract is simply too lucrative for VeriSign at the cost of everyone else. There are many companies capable of managing this contract at a fair and reasonable price. As GoDaddy’s James Bladel suggests in his testimony, everyone in the DNS industry would benefit from a competitive bid for the .com contract. Most importantly, end consumers. It is also worth mentioning Phil Corwin, who held the position of Counsel for the ICA, called on the Department of Commerce to slash .COM pricing by $2.00 back in 2012. When is enough money going to be enough? Let’s put American business first – as well as the millions of foreign Internet users and business. The operation of the .com registry should be operated by an operator who is eager to take on the contract but is willing to offer substantially lower pricing. Given the tremendous windfall profits that VeriSign has enjoyed to date, this is easily achievable for an operator in a competitive environment. Do you remember when a .com was over $100? Now its less than $10? I see nothing to complain about, especially since Verisign has has over 20 years of up time. Sounds like you are passing judgement on what is a fair rate of return for a private company, or you are just jealous. I think it’s fair for someone who pays lots of money each year as part of a monopoly contract that’s negotiated by the U.S. government and ICANN to question the terms of that contract. There’s no question that, if put out to bid, the cost of .com domains would be much, much lower. There are also plenty of capable registries with a strong track record. Just look at .eu pricing to see how low registry fees don’t translate to low retail pricing, Besides domain investors, for everyone else the domain cost is not significant compared to other online presence costs, so people don’t really care. Imagine if .com didn’t resolve for 15min across the globe. Imagine what that would do to the global economy. —- do you trust “go daddy” to maintain uptime on the .com infrastructure??? I certainly don’t.